Today is the birthday of Niccolò di Bernardo dei Machiavelli, Florentine historian, politician, diplomat, philosopher, humanist, and writer during the Italian Renaissance, which had its birth and flourished in the Florence of Machiavelli’s day. He was an official for many years in the Florentine Republic, with responsibilities in diplomatic and military affairs. He was a founder of modern political science, and, more specifically, political ethics. He also wrote comedies, carnival songs, and poetry. His personal correspondence is renowned in the Italian language. He was Secretary to the Second Chancery of the Republic of Florence from 1498 to 1512, when the Medici were out of power. He wrote his masterpiece, The Prince, after the Medici had recovered power and when he no longer held a position of responsibility in government. “Machiavellian” is now a widely used negative term to characterize unscrupulous politicians of the sort Machiavelli described in The Prince. The book itself gained enormous notoriety and wide readership because the author seemed to be endorsing behavior deemed, even then, as immoral. Sadly, like so many other great thinkers, Machiavelli is often misread and misunderstood. I am not going to try to excuse the fact that he condoned the notion that the ends justify the means. He did say that if you have to murder a few people – or a lot – it was worth it if it produced peace and stability (although you might argue that murder is not the road to a peaceful and stable nation – I do!). The fact is, though, that Machiavelli lived in a time when murdering enemies was the norm among the rich and powerful of Florence. You could think of him, therefore, as a man of his times – making an argument that the political realities of his day were necessary evils. But it is also true that when you read more than just The Prince you can see that Machiavelli was a complex and profound thinker. The irony is that the man himself was far from Machiavellian. 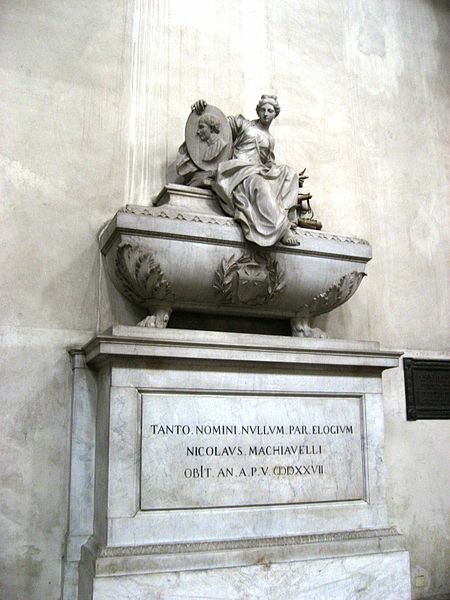 Machiavelli was born in Florence, the third child and first son of a lawyer, Bernardo di Niccolò Machiavelli, and his wife, Bartolomea di Stefano Nelli. The Machiavelli family are believed to be descended from the old marquesses of Tuscany and to have produced thirteen Florentine Gonfalonieres of Justice, one of the offices of a group of nine citizens selected by drawing lots every two months and who formed the government, or Signoria. However, Machiavelli was never a full citizen of Florence, due to the nature of Florentine citizenship in that time, even under the republican regime. 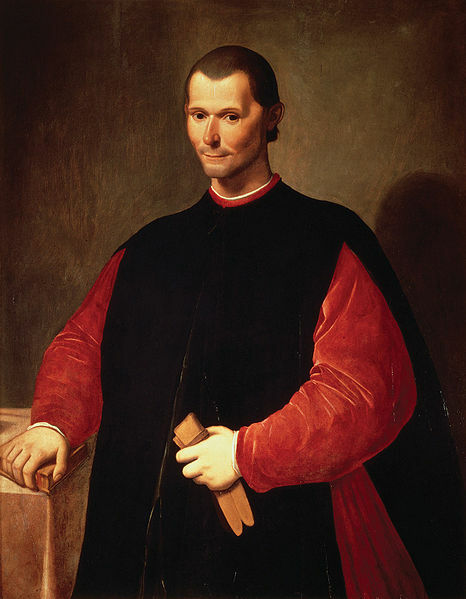 Machiavelli was born in a tumultuous era—popes waged acquisitive wars against Italian city-states, and people and cities often fell from power. Along with the pope and the major cities like Venice and Florence, foreign powers such as France, Spain, the Holy Roman Empire, and even Switzerland battled for regional influence and control. Political-military alliances continually changed, featuring condottieri (mercenary leaders), who changed sides without warning, and the rise and fall of many short-lived governments. Machiavelli was taught grammar, rhetoric, and Latin. It is thought that he did not learn Greek, even though Florence was at the time one of the centers of Greek scholarship in Europe. In 1494, Florence restored the republic—expelling the Medici family, who had ruled Florence for sixty years. Shortly after the execution of Savonarola, Machiavelli was appointed to an office of the second chancery, a medieval writing office which put Machiavelli in charge of the production of official Florentine government documents. Shortly thereafter, he was also made the secretary of the Dieci di Libertà e Pace. In the first decade of the sixteenth century, he carried out several diplomatic missions: most notably to the papacy in Rome, in the Italian states. Moreover, from 1502 to 1503 he witnessed the brutal reality of the state-building methods of Cesare Borgia (1475–1507) and his father, Pope Alexander VI, who were then engaged in the process of trying to bring a large part of central Italy under their possession. The pretext of defending Church interests was used as a partial justification by the Borgias. Other excursions to the court of Louis XII and the Spanish court influenced his writings and appear in The Prince and several other of his non-fiction works. Between 1503 and 1506, Machiavelli was responsible for the Florentine militia. He distrusted mercenaries. He explained his distrust in his official reports, and then later in his theoretical works, as being grounded in the fact that mercenaries fought for money and not for any belief in the cause they were fighting for, making their allegiance fickle, and often unreliable when most needed. Instead, he staffed his army with citizens, a policy which proved to be successful many times. Under his command, for example, Florentine citizen-soldiers defeated Pisa in 1509. But his success did not last. In August 1512, the Medici, helped by Pope Julius II, used Spanish troops to defeat the Florentines at Prato, although many historians have argued that this was due to Piero Soderini’s unwillingness to compromise with the Medici who were holding Prato under siege. In the wake of the siege, Piero Soderini resigned as Florentine head of state and left in exile. This experience would, like Machiavelli’s time in foreign courts and with the Borgias, heavily influence his political writings. The Florentine city-state and the republic were dissolved, and Machiavelli was deprived of office in 1512 by the Medici. In 1513, the Medici accused him of conspiracy against the Medici family and had him imprisoned. Despite having been subjected to torture (“with the rope,” where the prisoner is hanged from his bound wrists, from the back, forcing the arms to bear the body’s weight, thus dislocating the shoulders), he denied involvement and was released after three weeks. Machiavelli then retired to his estate at Sant’Andrea in Percussina (near San Casciano in Val di Pesa) and devoted himself to study and to the writing of the political treatises that earned his intellectual place in the development of political philosophy and political conduct. 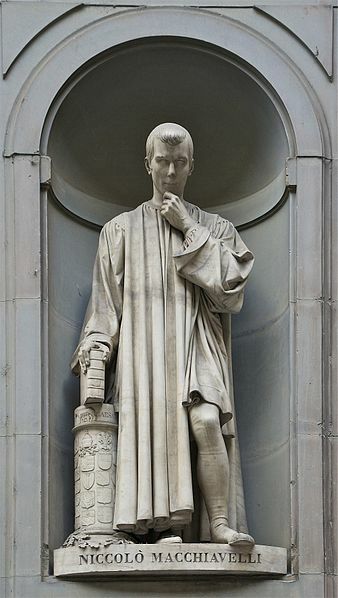 Lacking the opportunity to remain directly involved in political matters, Machiavelli began to participate in intellectual groups in Florence and wrote several plays that (unlike most of his works on political theory) were both popular and widely known in his lifetime. Still, politics remained his main passion and, to satisfy this interest, he maintained a well-known correspondence with better politically connected friends, attempting to become involved once again in political life. When evening comes, I go back home, and go to my study. On the threshold, I take off my work clothes, covered in mud and filth, and I put on the clothes an ambassador would wear. Decently dressed, I enter the ancient courts of rulers who have long since died. There, I am warmly welcomed, and I feed on the only food I find nourishing and was born to savor. I am not ashamed to talk to them and ask them to explain their actions and they, out of kindness, answer me. Four hours go by without my feeling any anxiety. I forget every worry. I am no longer afraid of poverty or frightened of death. I live entirely through them. Machiavelli died in 1527 at the age of 58, after receiving his last rites. He is buried at the Church of Santa Croce in Florence. An epitaph honoring him is inscribed on his monument. The Latin legend reads: TANTO NOMINI NULLUM PAR ELOGIUM (loosely: “there is no eulogy suitable for so great a name”). Machiavelli’s best-known book, The Prince (Il Principe), contains several maxims concerning politics, but instead of the more traditional subject of a hereditary prince, it concentrates on the possibility of a “new prince.” To retain power, the hereditary prince must carefully maintain the sociopolitical institutions to which the people are accustomed, whereas a new prince has the more difficult task in ruling – he must first stabilize his newfound power in order to build an enduring political structure. He asserted that the social benefits of stability and security could be achieved in various ways, including moral corruption. Aside from that, Machiavelli believed that public and private morality had to be understood as two different things in order to rule well. What works for the new prince in the pursuit of peace and prosperity for the state will not work on a personal level. A ruler must be concerned with his public reputation, of course, but also must be willing to act immorally at the right times. Thus, Machiavelli emphasized the occasional need for the methodical exercise of brute force and deceit. The Catholic Church banned The Prince, registering it to the Index Librorum Prohibitorum (List of Banned Books), and humanists also viewed the book negatively. Among them was Erasmus of Rotterdam, arguably the greatest humanist of his day. As a treatise, the book’s primary intellectual contribution to the history of political thought is its fundamental break with political idealism in favor of political realism. The Prince is a manual about acquiring and keeping political power. In contrast with Plato and Aristotle, Machiavelli insisted that an imaginary ideal society, as in Plato’s Republic, is not a model by which a prince can or should be guided. I find Machiavelli’s philosophy in The Prince and other works perfectly repugnant, but I will say a couple of things in mitigation. First, he was working with the political tools at his disposal. Go back to my post on Lucrezia Borgia (18 April 2014), and you’ll get the point. Second, we have to understand that the acts he described as necessary to secure peace and stability really were immoral in his eyes. But they were in service of the big picture. The goal of the new prince was not self promotion and self enrichment. The new prince was servant to the best interests of the people. In this context Machiavelli posed the ethical dilemma that we still argue about to this day: is it justifiable to torture and kill one person if it will save the lives of thousands? My answer is a firm and unequivocal no. You cannot build a moral state on immorality. Corrupt political methods breed nothing but corruption. If we have learnt nothing else from history we ought to have learnt that one by now. 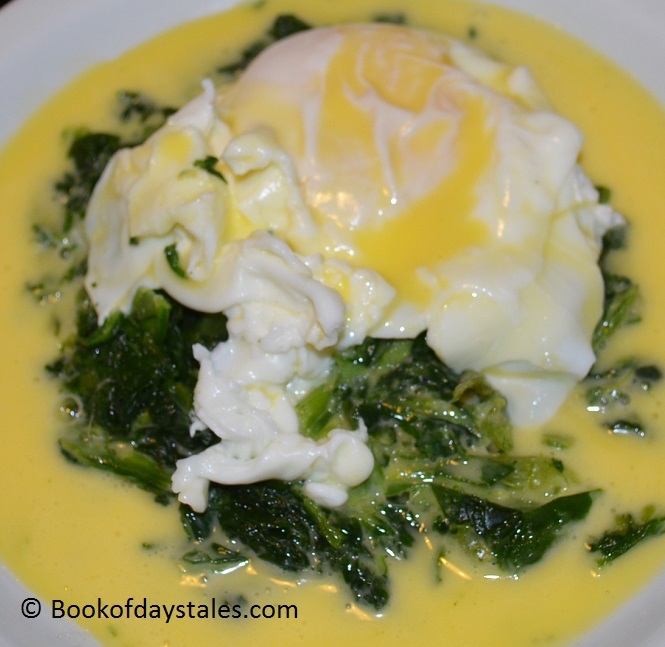 To commemorate Machiavelli and his home city, I present you with my version of eggs Florentine. “Florentine” in a culinary context means “using spinach.” So, technically, any dish featuring eggs and spinach can be termed “eggs Florentine.” I’ve seen recipes for the dish, for example, that are basically scrambled eggs and spinach. But the classic version is essentially eggs Benedict with the ham replaced with spinach. That is a toasted muffin topped with steamed spinach with a poached egg on top bathed in hollandaise sauce. I prefer to put the muffin (or toast) on the side, because no matter how gently you steam the spinach it always leaks juice which makes anything under it soggy. I’m not going to give you a formal recipe. If you are an experienced cook you can figure it out from my description and from this picture (I made this for breakfast this morning). The only tricky part is the hollandaise, which I will be precise about. It’s not complicated to make but you have to know what you are doing. You’ll need a whisk, a double boiler of some sort, egg yolks and butter. A hollandaise is a semi-cooked emulsion of egg and butter, and all emulsions are tricky. You are trying to combine two things that don’t want to mix. The proportions for hollandaise are ¼ cup of softened or melted butter, a squeeze of lemon juice, and a splash of water for each egg yolk. Place the egg yolks in the top of a double boiler on your counter top while heating water in the bottom to a simmer. If you do not have a double boiler suspend a stainless steel or heatproof glass bowl over simmering water so that the bowl does not come in direct contact with the water (otherwise the yolks will scramble). Whisk the yolks, water, and lemon juice together so that you have a smooth mix. Add a small amount of butter, place them over the steaming water and whisk vigorously. As the butter melts and begins to emulsify with the yolks add more butter, a little at a time at first, then increasing the amount as the emulsion forms and the sauce thickens. You should end up with a sauce slightly thicker than heavy cream. Keep it warm whilst you poach the eggs and steam the spinach. To make the dish, spoon a portion of spinach on a serving plate (I use a lot). Top with a poached egg and pour over it the hollandaise. I get very generous with the sauce too because it goes well with the spinach. Serve with buttered toast.